Well it´s Saturday evening, and I am listening to fancy music and playing with PowerApps (and Flow, Cognitive Services and Adaptive Cards). To not forget the following basics, I thought, it´s a good idea to document a quick intro for working with the Camera control and pictures in PowerApps. 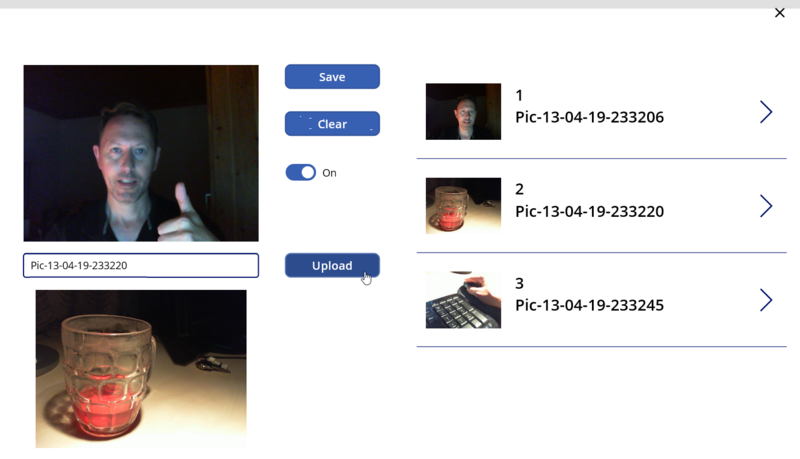 My setup is simple: A blank PowerApp in Tablet Mode with the following controls from left to the right: Camera1, ButtonSave, ButtonClear, Toggle1 and Gallery1 as in this screenshot. If your computer has more than one camera (as I have an internal camera in my notebook and an external USB camera attached), the Camera property Camera can switch between the devices. By default, Camera = 0. To switch to the second camera, change it to Camera = 1 in the control properties and so on. To allow a user to switch in his app, add a Toggle control and modify the Camera property Camera = Toggle1.Value as shown here (of course, if you have only two devices). In my setup, the internal camera shows the background of my monitor and parts of my desk (see app design #1 above), while the second camera is attached to my monitor and directed to me (design screen #2). You wont see anything changing in the Camera control itself. More on that below. I did simply run the app and clicked on the Camera1 control and the Save button to create and fill the collection with at least one photo. When the collection exists, I can bind the Gallery1 Items to that imagelist as shown here. Add controls as required, I just added my three collection items Id, title and the photo. To clear the collection with the Clear button, I added Clear(imagelist). To test it, I added multiple pictures by clicking on the camera for a snapshot and then on the Save button to fill the list on the right. Images must be transformed from the delivered Base64-encoded image to a Binary-encoded image. So, let´s add a Flow to a new ButtonUpload. We get data with the "Ask in PowerApps" feature. 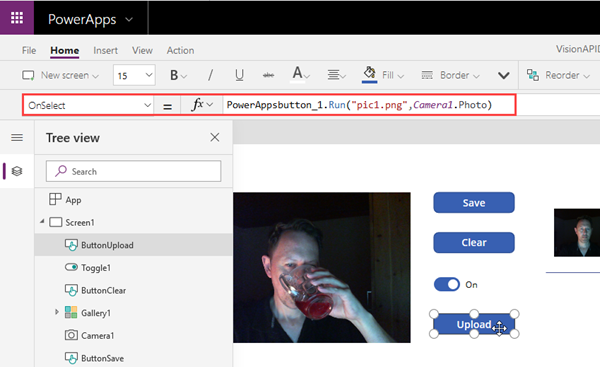 First, a SharePoint Create File action is added with the connection to a PictureLibrary. Then, a Data Operation Compose action is inserted to convert the picture to binary format as here. The PowerApp needs to deliver the image as "Createfile_FileContent" parameter that´s transformed here in a binary stream for storing as file. Then, the Compose Output is used for the file creation in the next step. For a detailed description, I found a step-by-step documentation at the Emtec blog team - thanks, guys! 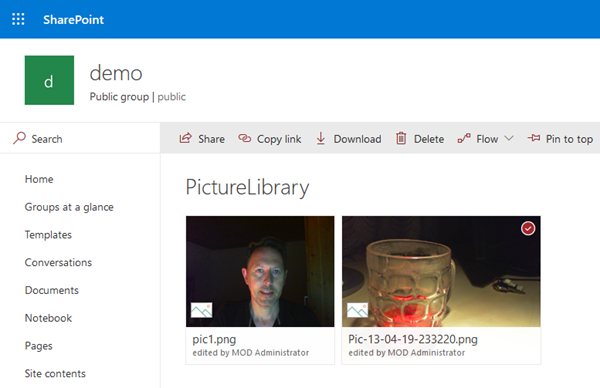 Run it, click the Upload button and see the result in the SharePoint PictureLibrary. This allows to work with SharePoint and pictures out of the box with very little effort and No-Code. At the end, I wanted to select a "saved" picture from the collection and upload it to SharePoint. 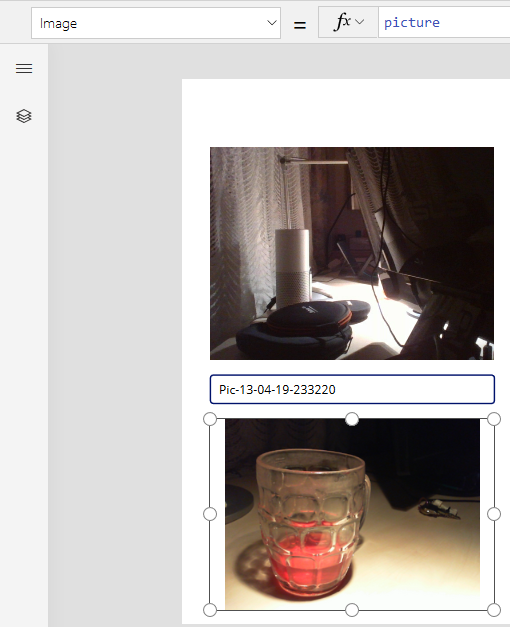 So I modified the PowerApp a little bit and added TextInput1 and Image2 and repositioned the Upload button. 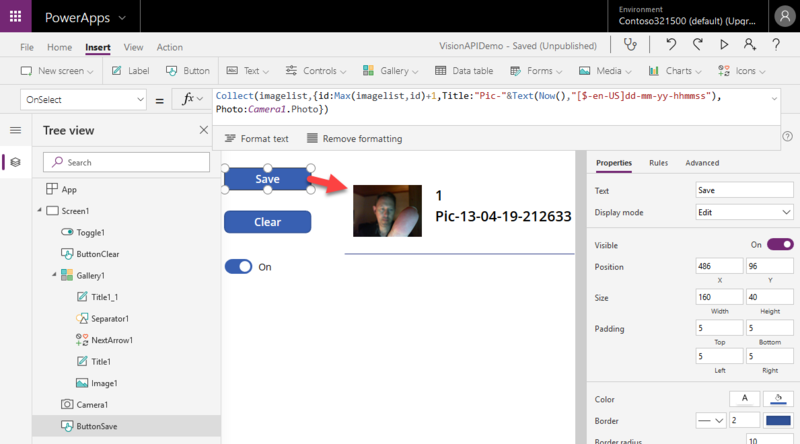 The idea is to select a picture by clicking on the row and then upload it to SharePoint with the Upload button as here. 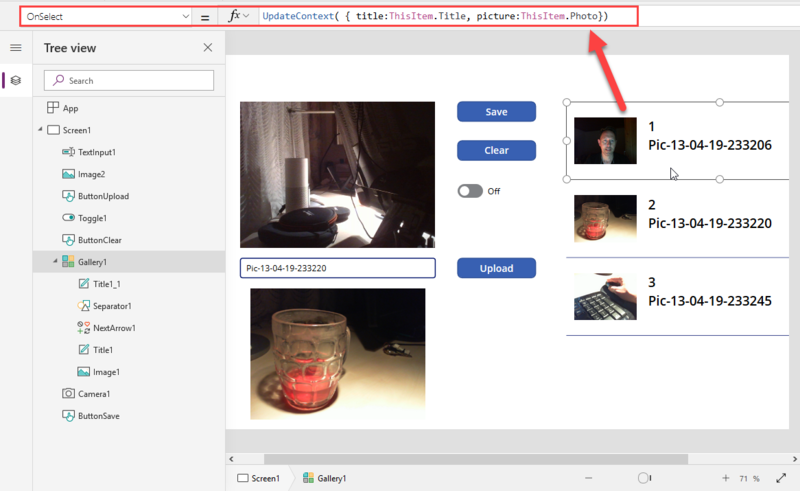 Now, TextInput1.Default needs to show variable title and Image2.Image needs to show picture in their visualization properties as here. Then I did run the app, selected an image from the list and clicked the Upload button to start the flow. After the flow did run, here we go in SharePoint. In my demo, the upload process and running the flow took just some seconds until the selected image showed up in the PictureLibrary. 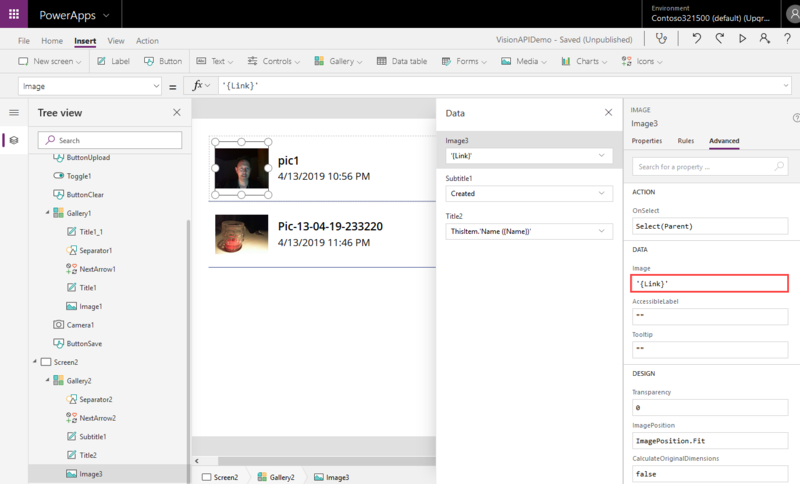 At the end, how to get pictures from a data source like SharePoint? So, I added the SharePoint Picture Library as data source and added a second screen with Gallery2. 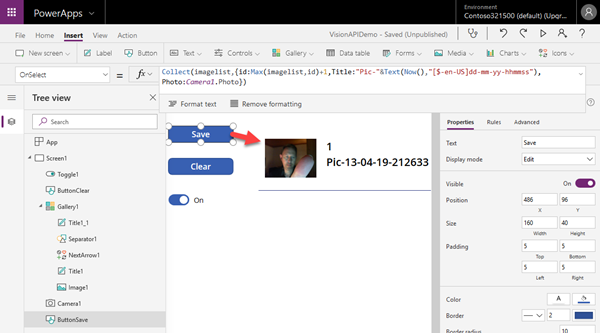 Well, you cannot select the data source Picture as Image source of the control... Then, a tip from Mikael saved me: How to display images from a SharePoint library in PowerApps. It´s important to mention, this currently only works in the web version of PowerApps and not on devices. In the article´s comments there is helpful info, e.g. 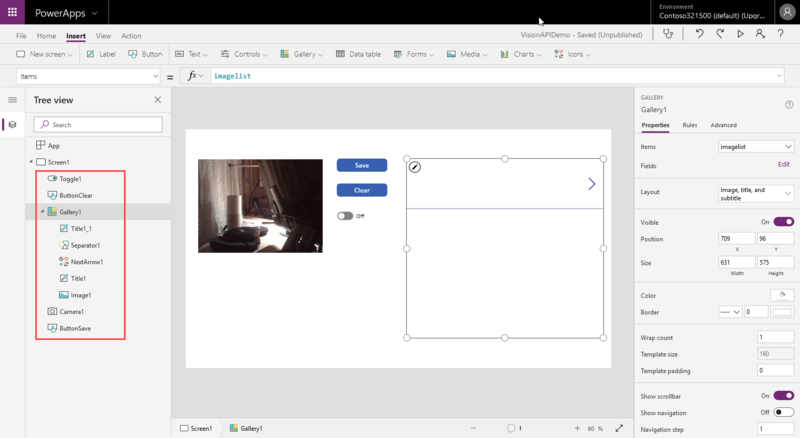 by Paul and by Bruce and an article at Display SharePoint images on mobile devices in a Canvas PowerApp to check out. 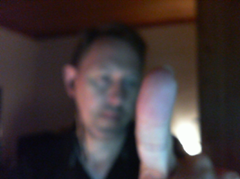 Then the Image is using the Picture object from SharePoint and renders the image as expected. Again, this currently only works in the web version and that´s a quick workaround. I hope, this will be solved better in the future, but this method works. Alternatively, workarounds are available with external solutions as Flow or, of course, custom connectors (as we did for some solutions). To mention: John just wrote a new and hot article Upload Image from PowerApps to Flow to SharePoint via an Unused Outlook connector. Check it out! Microsoft Power Platform also provide a good start. 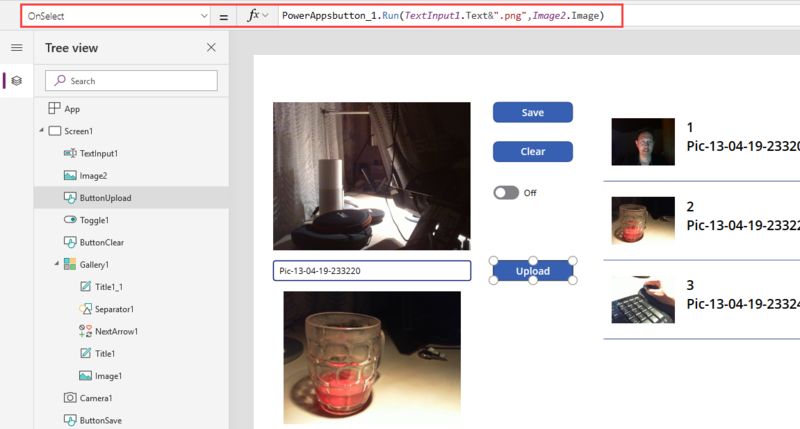 Have fun with PowerApps and images!